Today I’m reviewing a project called BtcHash. It has joined Golden Stage on DavidNews.com 6 days ago and has been online for the same amount of time. Admin of this HYIP has decided to create a different type of legend, which is not related to any industry. Now I have reinvested in BtcHash $400 and will keep you informed about its payment status on DavidNews.com monitor page. Keep reading to find out more interesting facts about this HYIP! As usual, I was ready to jump into the legend written by the admin. I was scanning the biography page to find any information about the industry where all deposits are invested. However, I couldn’t find anything. In the meanwhile, I found very interesting and personal legend, which stands out of the crowd among a number of other HYIP legends. It’s a story from a regular guy who was watching a movie of 80’s and got extremely bored. Sure, this narrative is used as an introduction and afterward the admin changes the topic to banks and their old-school approach of doing business. The whole idea of this story is that banks are boring and slow like movies of 80’s, but BtcHash is a new age. Well, it seems to me like an ambitious comparison. The project is only 6 days old, but let’s see what’s so special about it and how it’s going to outrank banks. Our regular readers might be familiar with a HYIP called BtcClock. This HYIP was reviewed on our blog in the May 2017. Even though the website of BtcClock looked different, there are many things in common with the HYIP I’m reviewing today – BtcHash. First, a daily interest rate of 3.84%. Second, affiliate program with 15% rate. Third, minimum investment in both programs is 0.005 BTC. Forth - member area looks really similar. So, what? Well, if you were among the first investors of BtcClock then most likely you made a profit in this HYIP. You can do your own research on forums to find conversations about it. Of course, this time admin (if it comes from the same person) can use a different approach. 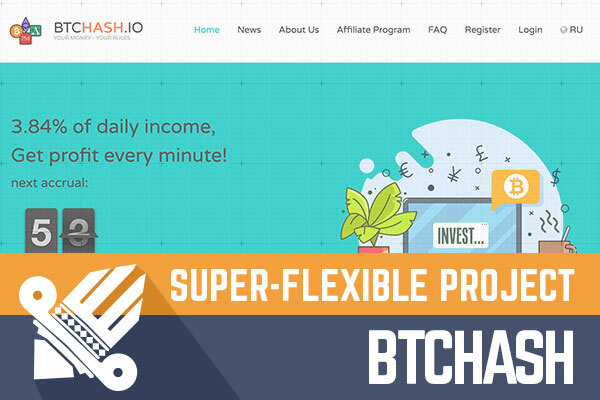 The website of BtcHash is very convenient to use and has a very attractive web design. It has sort of playful impression. However, it doesn’t seem childish to me, just playful. Sure, there is an interactive element on the top of the page – 1-minute countdown, which is showing how much time is left until the next accrual. If we remember the story written by the admin (or copywriter) then most likely option to withdrawal accrual every minute is an answer to 80’s movies and old-fashioned banking system, which author was giving out about. Of course, 3.84% daily rate is 0,002% a minute. Therefore, you might end up watching $ cents piling up. In the meanwhile, minimum withdrawal is $0.50. I’m trying to show you that it’s cool and interactive, but you might end up checking your personal account many times a day to check profit of a few bucks. 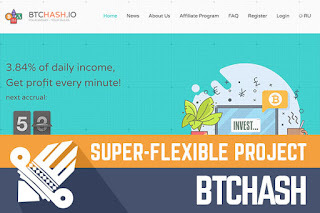 BtcCash is accepting deposits made with Bitcoin, PerfectMoney or AdvCash. Minimum deposit depending on the payment option is 0.005 BTC for Bitcoin and $5 for PerfectMoney or AdvCash. The website has extended SSL certificate from Comodo. The website is built on the unique script and has a unique design. Two language options are available on the website – English, and Russian. I believe Russian speaking investors are a major audience for the admin because he/she has also chosen to communicate with potential investors on the VKontakte (social media for Russian speakers). At the beginning, I mentioned 15% referral program. The calculation of this generous affiliate rate seems simple. However, there is something you need to keep in mind to avoid misunderstandings when receiving a regular referral fee. Referral commission is paid out within the time of 30 days. Why there is such term? The admin is trying to protect himself to avoid paying referral fees of canceled deposits. There is an option to withdraw initial deposit any time for 5% fee. This function must be the cause for the referral commission payment term. In fact, it makes perfect sense in this case when affiliate rate is so high. I already mentioned that accrual withdrawals are free of charge but need to be at least $0.50. Another interesting thing that you can use your withdrawable fund to increase the deposited amount. Keep in mind that you can make withdrawals using the same payment method you used for the deposit. The most important feature for investors that have a sixth sense predicting when HYIP will stop paying is an option to withdraw whole deposit or part of it. There is 5% fee, but it’s still nothing compared to possible losses. Withdrawals are performed mainly during business hours. What have we got here? Most likely it’s a second HYIP from the same admin, which has been launched a half year after launching the first program. BtcClock collapsed in July this year (4 months after the launch) and I believe it was an excellent result for that project. The website looks and functions well and I couldn’t find anything to complain about. The investment calculator is something I would expect on such website with friendly interface. Sure, my task is to do the calculations for you anyway. Therefore, it’s not a big deal. In the meanwhile, plans look really promising and feature to withdraw deposit any time looks great. However, nobody will tell you when the admin will decide to close it. Therefore, if you ever decide to make any investments, don’t invest more than you can afford to lose! Were you one of the BtcClock investors and can share any recommendations to our readers? Please drop a message in the chat box! Investment plans: 3.84% daily for an unlimited term, possibility to withdraw initial deposit anytime with 5% fee.